In September systematic violations of human rights continued, including a growing wave of public and secret executions, hand amputation, floggings, torture to death of detainees and killing of porters. 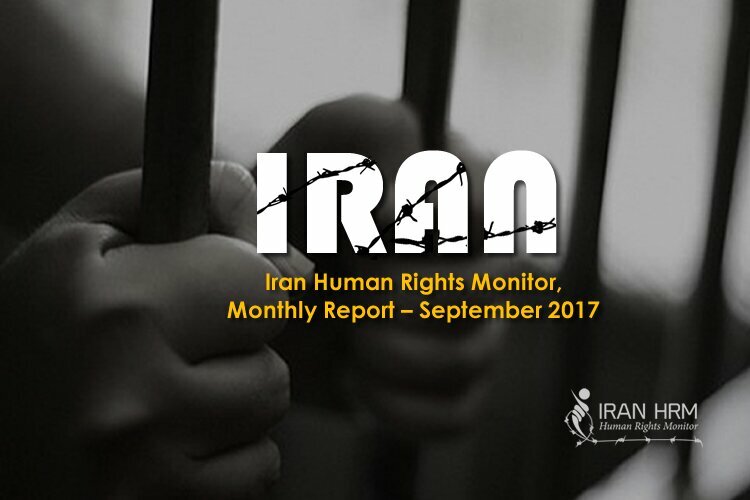 In the following report Iran Human rights monitor tries to announce a series of human rights abuses in September. Iran Human Rights Monitor have registered 42 executions in the month of September from which 22 have been made public by the state media. Therefore, the actual number must be considerably higher. From all executions seven were carried out in public and others were implemented in the prisons of Ardebil, Borujerd, Khorramabad, Mashhad, Zanjan, Kerman, Qom, Karaj, Qazvin and Tabriz. Amongst those executed there is a woman identified as N.A. who was hanged in the Central Prison of Zanjan, in northwestern Iran. The state-run Mehr news agency reported her execution on September 19, 2017. On September 19, two men including a 23-year-old prisoner were hanged in Ardebil Prison while they were both handcuffed and shackled. The young man had been sentenced to three years behind bars, however later he was sentenced to death on new fabricated charges. An audience of fellow inmates were assembled to witness their executions. These inhuman acts are carried out on the order of prison officials aiming at tormenting inmates before their executions. On September 20, at the same time as Iran’s President Hassan Rouhani delivered his speech at the United Nations General Assembly, 14 executions and 3 death sentences were carried out. According to human rights monitoring reports, from 170 prisoners held in Ardabil prison, 25 are on death row whose death sentences have been upheld by supreme court. Many of them were under the age of 18 at the time of committing the crimes. Seven porters were shot dead by the regime’s border guards. An 18-year-old juvenile was shot dead in the northern city of Abadan. A young Baluchi man was shot dead in Khash region in Sistan and Baluchestan Province. In the last weeks of September, the warden of Zahedan Central Prison ordered to transfer a 22-year-old prisoner identified Isa Barahouei to solitary confinement where he had endured torture by prison guards. Subsequently the inmate committed suicide in solitary cell to end his suffering caused by ongoing torture. According to reports released by Iran’s Human Rights Monitor, Iran continued to use of cruel punishments, including floggings and amputations. Following are some instances of such inhuman acts of torture. Two prisoners identified as Darush Rashidi and Kazem Shiri were flogged before being executed on Sunday, September 3, 2017, in central prison of Tabriz. A death row prisoner was summoned by the head of the section on September 3, and was taken to the prison courtyard. He was told that his death sentence was to be carried out and that he should get ready. He was then subjected to a mock execution and later returned to his cell. An 18-year-old teenager was sentenced to 100 lashes on September 5. The order of 80 lashes was carried out in Iran on Tuesday afternoon, September 19, 2017, for Leila Bayat. Leila Bayat had sought refuge in Norway but had been deported and sent back to Iran in March 2017. She had been arrested in 2007 along with three of her friends in a private party and sentenced to 80 lashes for drinking alcoholic beverages. Prisoner Meisam Saber, who is detained in the Central Ardabil Prison, was chained to the prison bars of the quarantine section on September 23, following his protests over the behavior of prison guards. He was returned to his cell after 24 hours. Thirty-six-year-old prisoner Moslem Shiry, who is detained in the Central Ardabil Prison, is under torture and constant pressure by the head of the internal ward Farhad Nowruzi. On September 18, Norouzi transferred him to the external quarantine section and flogged him. Moslem Shiri has told his cellmates that last month his hands were tied, his feet were shackled and he was tied to a pole so he could not resist the strikes. Then he was tortured for 24 days. He is now suffering from a pelvic illness. The head of the ward has repeatedly told the prisoner that his punishment was not to die by the gallows but that he would kill him slowly and that his voice would not reach anyone. The Deputy Prosecutor of Qom announced the implementation of hand amputations for three people charged with robbery, according to the state-run TV Website report on September 21, 2017. In another development two young men were sentenced to have their fingers amputated for stealing from a meat store in Tehran. They were arrested while carrying bags of sausages, the state-run Roozplus Website reported on September 19, 2017. A total of 983 arrests have been registered in the month of September, including 513 social arrests, 60 political motivated arrests, 137 arbitrary arrests and 273 arrests on religious grounds. Political prisoners in ward 10 of Gohardasht Prison, switched their 40-day hunger strike into a political fasting on September 8. The warden of Gohardasht Prison ordered to fabricate new cases against 11 of these prisoners, adding two years and a half to their prison terms. The 11 are as following; Abolghasem Fouladvand, Amir Ghazizni, Abrahim Firouzi, Hassan Sadeghi, Saeid Shirzad, Shahin Zoghi Tabar, Payam Shakiba, Majid Asadi, Shahid Eghdami, Saeid Masouri and Reza Akbari Monfared. Health condition of the striking detainees is deteriorating, as they suffer from loss of balance, low blood pressure, low heartbeat and other health problems. The prison Warden however, issued a circular on September 9, imposing strict pressures to the prisoners. Some of the prisoners including Saeid Shirzad, Reza Shahabi and Mohammad Nazari continued their hunger strike and after 60 days their health condition reported dire. Prisoner of conscience Soheil Arabi, switched to a dry hunger strike on September 23, protesting his detention and pressures imposed on his family. No information is available on the status of Kurdish political prisoner, Ramin Hossein Panahi, who was injured and arrested by IRGC forces. Officials however refused to disclose his fate or whereabouts and no security authority have responded to his family. Hassan Jafari, husband of political prisoner Maryan Akbari Monfared said in an interview that his wife needed medical treatment but that Evin prison authorities refused to allow her to go to the hospital for treatment. “Despite her being in prison for close to eight years, she is still denied the right to a prison leave and does not enjoy any of the rights she’s legally entitled to”, he added. The mother of political prisoner Atena Daemi, who is detained in Evin Prison, said that her daughter had to undergo gallbladder surgery at the Khomeini Hospital but refused to be hospitalized after the head of prison specified that she had to have handcuffs and foot shackles the whole time she was in the hospital. The new academic year started in Iran as Suppression of Religious and ethnic minorities continued and dozens people have been deprived of studying at university in various cities of Iran, despite attending the university entrance examinations. At least 120 Baha’i citizens who participated in the 2017 General University Admittance Test were denied entry to university and higher education due to their religion.